“If you’d like to push me and speculate on what might happen in a no-deal scenario in Ireland, I think it’s pretty obvious – you will have a hard border”, said Margaritis Schinas, the EU Chief Spokesperson on Tuesday, causing shock in the Republic, where there has been blind faith that the British government would inevitably be forced to accept the backstop. Varadkar hasn’t suddenly joined the European Research Group, but he’s had an unpleasant bucketload of reality dump on him. It’s a dramatic volte face, since when he came into office in June 2017, the Taoisach opposed the idea of bilateral negotiations with the United Kingdom and deliberately dismantled the arrangements his predecessor – Enda Kenny – had set up with London and Northern Ireland officials to minimise the negative effects of a border could be minimised. 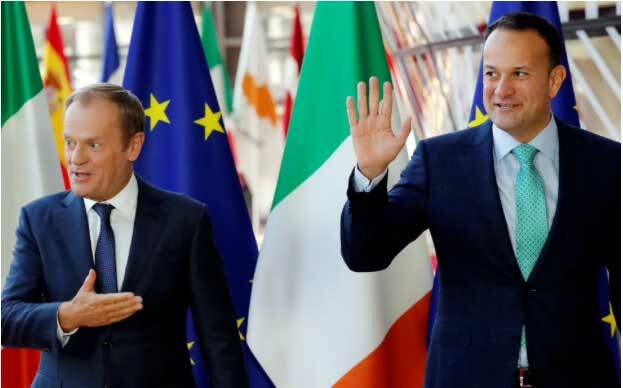 Mr Kenny had many years operating in the EU corridors of power, but Mr Varadkar, naïve, inexperienced and keen on waving the green flag, thought he knew better. He made no efforts to develop relationships with pro-Brexit politicians in Belfast or London, and when informed suggestions were made about technical solutions that could avoid any provocative physical structures that might slow down trade or tempt terrorists, the Irish government joined the scoffing Brussels chorus. He was very popular with the Commission. They knew a useful idiot when they saw one. The Irish have mostly supported him. Appalled by what they find a completely incomprehensible decision by the British electorate, incredulous that British politicians should honour such a foolish referendum outcome (this, after all, is the country that obediently re-ran two referendums in order to come up with the right answers on the treaties of Nice and Lisbon), and indulging in a mixture of contempt and hilarity at the mess Prime Minister May and her ever-changing Cabinet are making of the negotiations, unsurprisingly they’ve been indulging in Schadenfreude. It is understandable that, however well the British and the Irish get on individually, a small country finds it hard to shake off an inferiority complex about the big neighbour which dominated and in the distant past often bullied it. There has been since the referendum a deep resentment that the United Kingdom should be so uncaring and cavalier as to vote Leave with no regard for the consequences for the small island they share. But there was comfort that while the British were making eejits of themselves, the Irish were secure in the warm embrace of the EU Commission and the 26 other member states. The few critical voices in Ireland that warned against betting the country on the promises of the Commission were ridiculed or howled down. Irish Anglophobes have frequently looked to Continental countries to come and rescue them from the British, and can’t seem to shake the habit although they have been let down variously and at different times by the Spaniards, the French, the Germans and a few smaller players, all of whom, of course, had their own anti-British, agendas. Just as a punitive EU has now. So as Mrs May trapped herself in one corner, Mr Varadkar backed himself dutifully into another. The Good Friday Agreement, which is irrelevant to the negotiations, became an instrument for virtue signalling. President Jean-Claude Juncker was to the fore: “We agree,“ he told the Irish Parliament last June, “that there should be no return to a hard border, we need to preserve North-South institutions, and the Good Friday agreement should be preserved in its entirety”. There is a symmetry now about the chaos prevailing in Dublin and in London, with discussion in Brussels about border checks in France or the Netherlands in the event of a no-deal Brexit, operating with the EU treating the UK and the Republic “as one block”. Brussels’s eyes are smiling.